Stuart extends its excellent range of benchtop science equipment with the new SCF1 Spinner, for centrifugation of microfuge tubes at 6,000rpm. This small, lightweight unit couldn't be easier to use. Spinning starts as soon as the lid is closed and stops automatically when the lid release is pressed, though it can also be operated via a mains on/off switch. Two rotors are supplied: microtube for up to 8 x 1.5ml or 2.2ml microfuge tubes, and strip tube for two strips of 8 x 0.2ml tubes. The rotors can be quickly exchanged without the need to use any tools and speeds are fixed at 6,000rpm for the microtube rotor and 6,200rpm for the strip tube rotor. 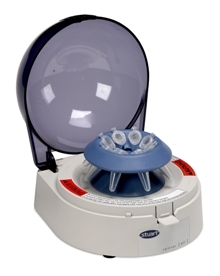 The SCF1 Spinner provides a quick way to ensure that any condensation or droplets are returned to the bottom of the tube after sample thawing or mixing. Other applications include rapid pelleting, and spinning PCR tube strips prior to thermal cycling so that all reagents are in the bottom of the tube.